Ad blocking apps are few and far between on iOS right now. According to user reports they don't work very well, but both of those details are bound to change when Apple releases iOS 9. The next version of Apple's mobile OS is going to feature system level support for the blocking of adverts and tracking scripts. That's going to make the ad blocking far more effective than the current apps and web browsers, which require web proxies and only work over Wifi. Developers have already started working on apps which take advantage of the new parts of iOS 9, and late last week one such developer released a demo video which shows their app in action. 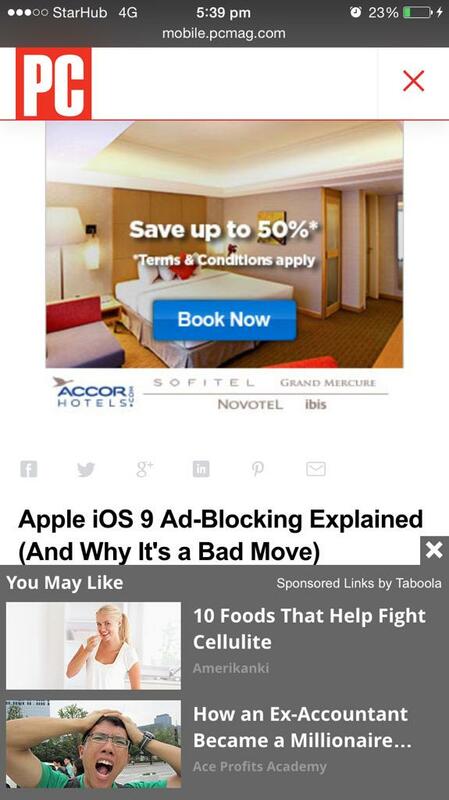 iOS 9 isn't expected to be released until this fall, but when it is released I will probably install an ad blocking plugin. I have found adverts to be a relatively minor nuisance on the iPad; the screen is large enough that ads are annoying but not horrible. But the iPhone is a different matter; as we saw in the demo video above and as PC Magazine showed us when they took a stance against ad blocking, there are some sites which are simplify unusable on the iPhone because they are drenched in adverts. You can see PC Magazine's website at right (courtesy of Marko Karppinen). I would expect most iPhone owners are going to leap at the chance to remove such annoying adverts. I certainly would, and even though I earn my living from adverts I have no sympathy for the likes of PC Magazine. Anyone who has ads as obnoxious as what we see at right has brought this on themselves. I use Weblock on my iPad and it works great on Wi-Fi connections. It doesn’t work with well with mobile connections.